Nicaragua will elect their president of the republic, national, departmental and Central American representatives this Sunday by means of popular vote. The Electoral Supreme Court (CSE in Spanish) organizes the election, as usual, and the lack of an automated process (electoral register, voting and vote count) is one of the characteristics of constraint from a technical and even political standpoint. Regarding this issue, the Institute for Development and Democracy (IPADE in Spanish), a non government body with over a decade of experience on electoral observations, analyzed the preliminary electoral registries published in 528 voting stations, in 63 municipalities of the country and was able to prove that seven of every ten official documents of the CSE had names of deceased persons. Also, by means of the results from Third Electoral Observation Report of the IPADE, released mid October, it was recorded that in over 70% of voting stations monitored, where preliminary registries were published last August 8th, names of deceased persons were also detected. 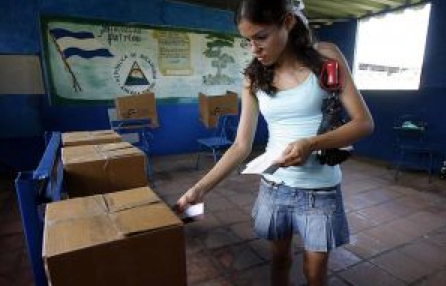 As a result, the organization has addressed the need to perform an audit to the registry of voters in Nicaragua. The lack of automated systems is replicated in voting, which is done manually. This starts in the vote collection committee, these bodies are in charge of counting votes, under the oversight of organization watchdogs with political purposes. This information is sent to the Department Electoral Councils, who must also solve challenges. Lastly, the CSE has to revise resolutions made by the Department Electoral Councils. The entire scheme has been in sight from several studies, given that transparency mechanisms have been doubted about. The 3rd report from the Media Observatory of the Communications Research Center (Cinco), published on October the 5th of 2001 revealed “the lack of transparency in electoral management, on behalf of the CSE, has been the main concern of the media in the country in the period time between August and September of the present year”. Likewise, research highlighted “the confusion between government-family-state”. By joining these four elements, according to Alfonso Malespín Jirón, member of the advisory council of the Observatory, “a process that has been brewing throughout these five years en the government´s communication strategy, which said that the final objective was none other than to destroy the institutionalism found in 2007. And progressively in this process of confusing family interests with those of the party, government and state have worked against democratic institutionalism of the country”. Therefore, the lack of automation, as well as the rules that generate transparency, can involve the electoral body in a political game, taking credibility away from elections to be carried out. The outraged movement in Spain is practically a march. Mentioning it already leads to a series of attributes that have spread it like a virus all over the planet: a social fight, engagement, support and the search of solutions to the problems of the people and the world. The claims of this group, self-called 15 de Mayo, as this was the date when the first mobilization took place on a national scale (where 50 cities in Spain participated) can be gathered in its catchphrase: Real Democracy Now. Its demands go from the economic area (tax reform, mortgage, financial) going from social (decent housing, zero discrimination, free and universal healthcare) to politics (engaged democracy, separation of power, and transparency in public conduct). Most of the demands are of universal nature, and there for, the Outraged are not only of Spanish nationality, but also English, American, Italian, Japanese, and many others. What is special about these groups is that they gather people from all types of social backgrounds, ages, religions and educational levels. But they all blend in a desire to have a better and fair world. It is also important to highlight that, a movement that is concerned about changing the way how the political and economical system has evolved, should recognize that, in parallel, should give a shift to the conception of government. Besides, it is also necessary to modify the way that authorities are elected (open lists with single constituency and a proportional model) and scheme used until for voting. This is how the process that the Outrage seek, born from the need of being heard and understood by those who hold power, also involves the transformation of the electoral system by way of electronic voting. This approach sets on the table that automated vote is a flag clenched by citizens to have a democracy based on clean, reliable and quick elections. The spokesperson of the 15M movement, Claudia Álvarez explains: “The citizens should be able to pass bills, use electronic voting, just as proposed by Democracy 4.0, or be able to collaboratively write a Constitution similar to the Iceland wikiconstitution”, she pointed out. 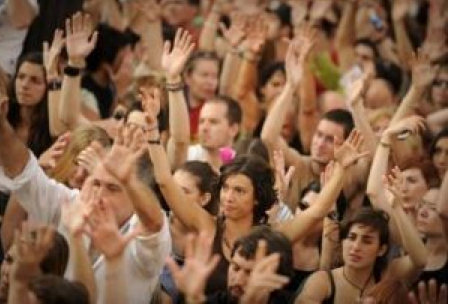 In Spain, electronic voting has had several rehearsals, but no autonomous community has been able to take off and put into practice the system that has been infallible in each attempt made. The Outraged, in the face of general elections for next November, can be the last boost for authorities to formalize the intention of revamping voting. This nation can compare itself with their European equals and even match the trajectory already reached at full speed and successfully by Latin American countries. Google has paid homage to the electoral activity in Argentina. A quick look at the doodle designed for this occasion exempts us from further comments made around the absence of technological evolution in the national elections this October 31st. Besides validating certain provincial decisions for the implementation of electronic voting in local elections and allowing incipient experiences related with a single ballot, the national government of Argentina has not given a signal in terms of walking towards the path of replacing the old electoral system. El Clarín, the local newspaper of that day has expressed that “electronic voting is taking baby steps in Argentina”. In the province of Buenos Aires, which represents 35% of the national constituency, this new voting system was put into practice in only 5 districts and only for foreigners. La Plata, Berisso, Pilar, Villa Gesell and Pinamar were chosen to innovate with electronic voting. 34,490 foreigners had the chance to vote through this new modality in the province of Buenos Aires. In order to cast a vote (electronic vote), the voter receives an electronic card at the polling station. Once in the dark room, this card is to be dipped into a reader, which will allow you to select the candidates of your choice by way of a touch screen. Once selection is made, a voting receipt is printed and drops inside a sealed urn. According to trainers, this new system makes voting and vote recount easy once poles are closed. It is important to remember that foreign citizens with an Argentine national ID can only vote for up to Provincial Governor, and are disabled to vote for president. The continuity of Mrs. Fernandez de Kirchner´s administration has the true capability to produce a technological change; we will follow her next steps closely.